I’ve recently started eating this yummy quinoa granola for brekky – it’s great with some plain yoghurt or even on its own. It’s super easy and quick to make! Cool for 15 minutes and store in an airtight container. Post your creations to Instagram and tag @allergianabroad, telling us what you think! 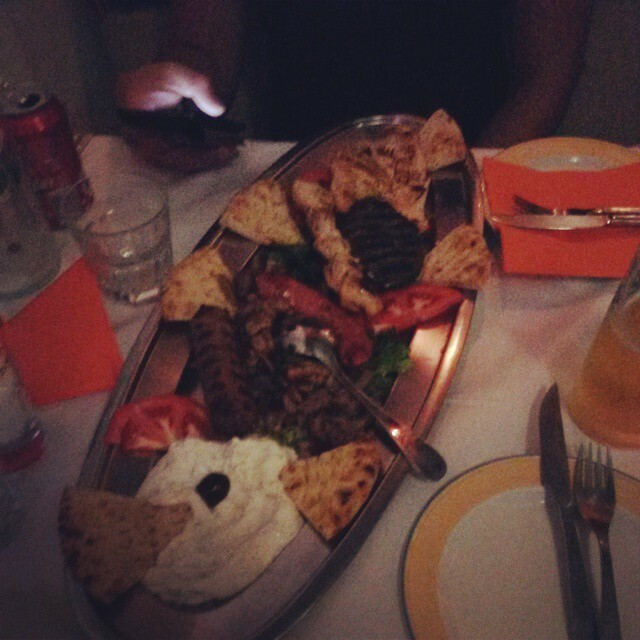 I had a ball eating in Greece. 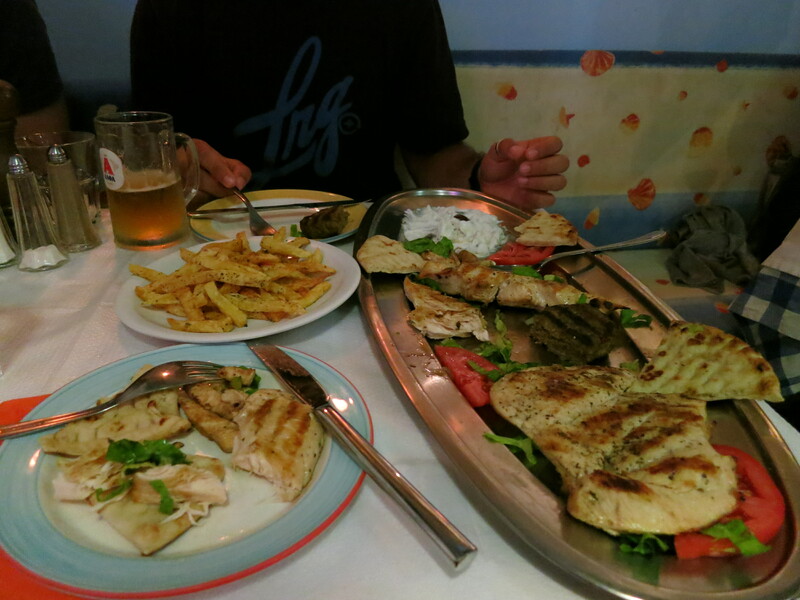 I hadn’t eaten too much Greek food before visiting Greece, but realizing that the Greek cuisine pretty much consists of various forms of meat, I knew it would be a winner. The next 9 or so days involved eating far more gyros than I’d like to admit. But when they taste that good and cost 2 euro (about AU$3.50!! ), how could I pass it up??? 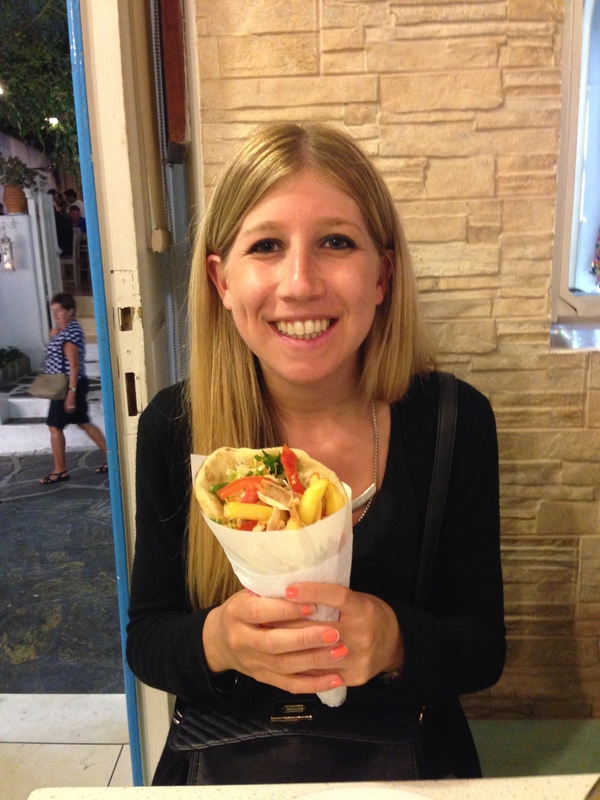 The gyros in Greece (pronounced “iros” [… or something like that]) comprise your choice of meat, some salad, tzatziki and chips in a delicious pita bread. I always ordered the chicken, because, to my surprise, lamb gyros weren’t all that common in Greece. I had to leave out the tzatziki (because of the lactose), so it probably wasn’t quite as delicious as it otherwise would be, but it was still pretty darn good. I found that wherever you went, the gyros were amazing. You don’t need to go to some fancy restaurant to get good food in Greece – and in fact, I think the less fancy, the more authentic. The two best gyros I had in Mykonos were at Tropicana (surprisingly, given it is essentially a bar) and at Saki’s Grill House (which is known to be the best gyro in Mykonos). The Saki’s Grill gyros were huge and the pita bread, in particular, was to die for. I’d definitely recommend a visit! 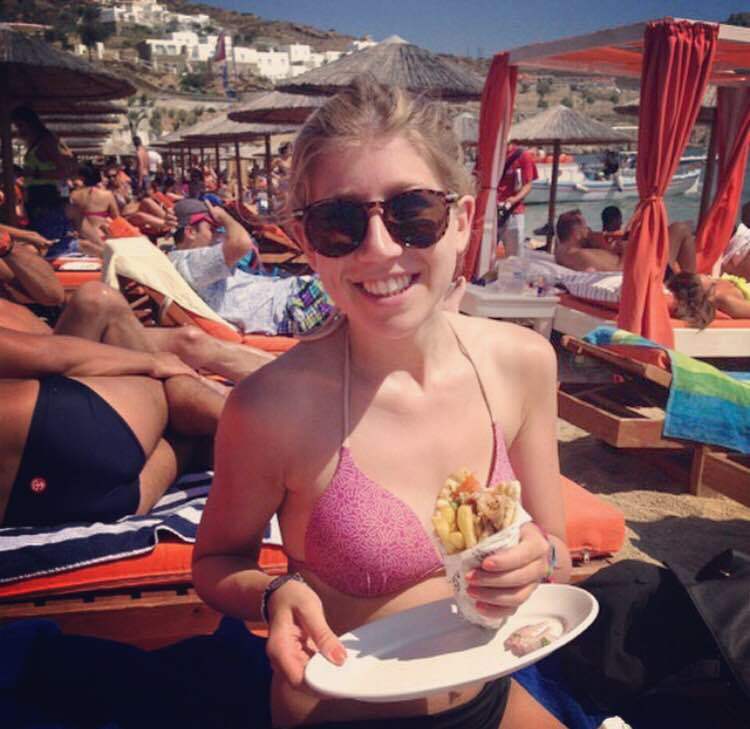 The Tropicana gyros tasted delicious and could be enjoyed while lounging on the beach soaking up the sun! We also decided one night to splurge a little. The BF and I met up with 2 other friends and we went to a restaurant for a feast. Many of the restaurants offer these giant mixed plates to share between 2. We got chicken shashlik, chicken wings, sausages, hamburgers, pita, dips, chips and more. It was 26 euro for 2 people (about $38 for 2) which was pretty good value because we were popping afterwards! Apologies for the awful photos and, no, this wasn’t the full platter. The thing I loved about this restaurant [and sorry I can’t remember the name], apart from the delicious and never-ending plate of food, was the ambiance. I remember it so clearly. You sit outdoors in the heat in a giant space cluttered full with tables, people, food and chatter. It was a hullabaloo, an organised chaos, an exciting pandemonium; it was wonderfully atmospheric. Let me talk a bit about my allergies in Mykonos. I don’t think that allergies are particularly common in Greece. Generally, when I gave my beautiful Greek nut translation sign, people thought I was a little bit crazy. I’d say that Greek people had a bit more of a blasé attitude towards allergies as compared to those in Italy and Spain, but that was possibly because of the nature of the food, in that there was probably no way that there would be nuts inside a gyro and therefore they thought I was crazy for asking. I wouldn’t say that they were careless about my allergies, but just that it wasn’t taken quite as seriously. I did, however, usually get a better response to my allergies when I was eating at hotel restaurants/bars (eg at Paradise Beach), where the staff are probably more accustomed to dealing with allergies. This being said, however, I felt like I didn’t need to worry as much about my allergies because it was always pretty obvious what I was eating. You could see the gyro meat being cut off the spit in front of you, or you knew that you were eating plain meat without any sauce. There wasn’t anything snuck in there. I had also done a bit of research with my Greek friend, who gave me the low down, and so I knew that nuts are not particularly common in the Greek cuisine, but are quite common in Greek pastries/desserts (eg Baklava). What I did love about Mykonos was that I got to enjoy dessert. Say what? OK well not dessert, per se, but let’s just call it that. You’ve all (hopefully) read about my disappointment in not being able to enjoy the exciting desserts in Spain and Italy, which generally consisted of nutty or potentially nutty delights. 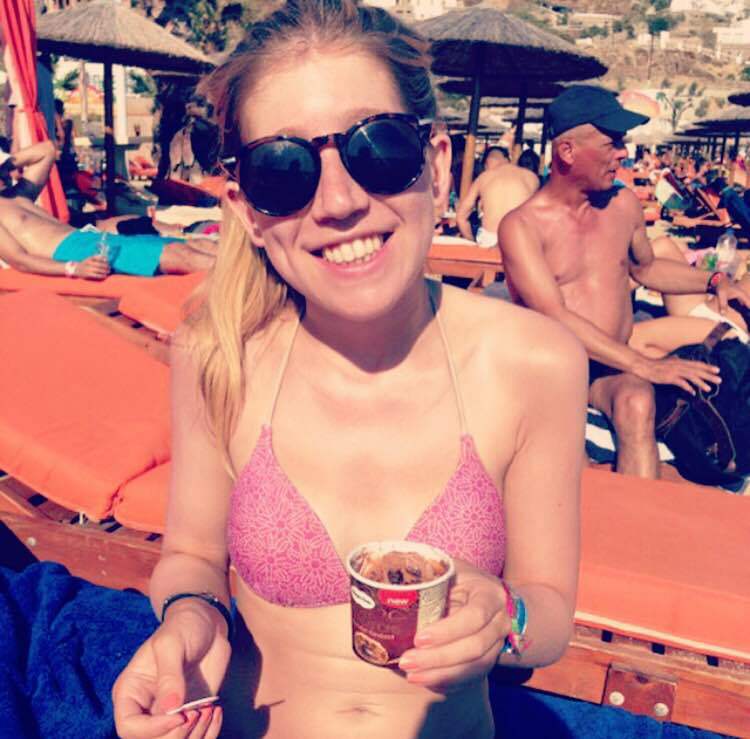 In Mykonos, when lying on the beach in the scorching sun, a delicious ice cream is exactly what one craves. Paradise Beach has a lovely little set up where you can get just about anything (there are restaurants, bars and also a little canteen-ey type place where you can get all sorts of snacks). I went to go look at what ice cream options they had and unfortunately faced a whole lot of gibberish (Greek) ingredients. Until I found the packaged Häagen-Dazs ice cream tubs – complete with English ingredients. Woohoo! These were mini tubs and there were heaps of different options to choose from. Whilst there were 1 or 2 that contained nuts (but not peanuts), most of the flavours were nut free. The first one I had was crème brulee, which was beyond amazing. The ice cream had chunks of caramel inside, dripping with crème brulee sauce (which tasted a lot like real crème brulee). The second flavour I tried was the chocolate fondant. Wow was it good! It was chocolate ice cream with chunks of brownie, drenched in chocolate sauce. It was definitely worth cheating on the lactose intolerance front! Who needs an Italian hot chocolate or some sort of delicious Spanish pastry when you have Häagen-Dazs ice cream!? Ok I realise that for most non-Allergians, this isn’t all that exciting and it’s probably no comparison, but I’ll take what I can get. Generally, the biggest dietary challenges in Mykonos would be 1) vegetarian and 2) dairy allergy / lactose intolerance. For the vegetarians – I’m sure you would know to expect (almost) nothing but meat in Greece. There’s always the salad option though, and of course lots of cheese. Being an island, I’m pretty sure there were some fish/seafood dishes/restaurants on offer, but meat was the overwhelming majority. For those allergic to dairy / the lactards – the Greek cuisine is full of dairy – between the tzatsiki, the halloumi, the Greek yoghurt and the feta, there’s plenty of it. That being said, however, it is easy to avoid these things and you can almost always leave the dairy out. There’s always something else to eat. Ouzo. It’s the Greek specialty liqueur, more particularly, an anise-flavoured aperitif. AKA, if you don’t like liquorice, do not try this. My friends and I bought a bottle and were told to drink it 1 part ouzo, 3 parts water. I smelt the bottle and (as an avid liquorice-hater) could not bring myself to drink it [I think I was still scarred from the limoncello and grappa in Italy]. The far more daring 3 guys I was with took on the challenge and drank their shots of Ouzo and I got to enjoy the looks on their faces once they were downed. Classic! That’s all from me folks. Next stop: Ios! This is by far my favourite dessert of all time. 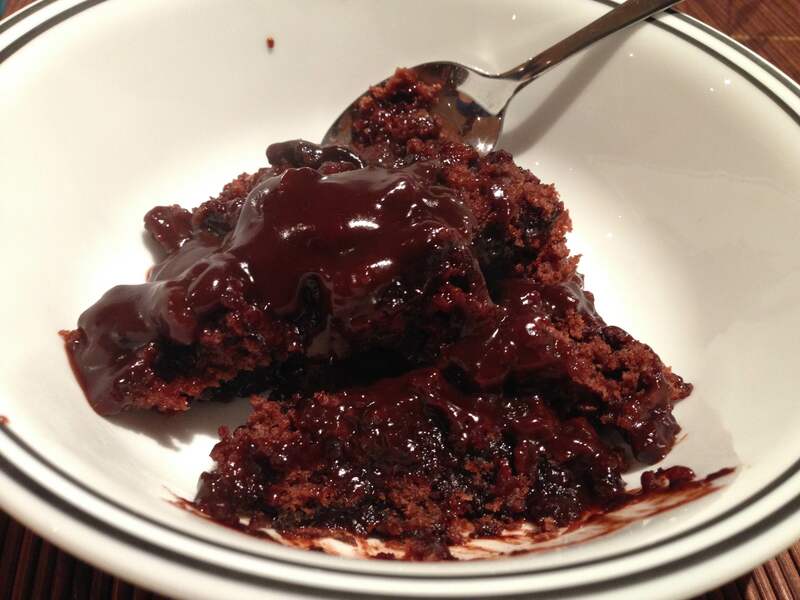 Given all my allergies, there aren’t too many delicious dessert options, so I’ve grown up eating my mum’s (Jackie’s) self-saucing hot chocolate pudding. And boy is it gooood. How can something that is nut free, dairy free and soy free taste so damn delicious? Go on, give it a try. It’s pretty easy to make too! Sift flour, salt and cocoa. Add white sugar and mix well. Stir in milk, vanilla and melted butter/margarine. Spread evenly into a greased dish. Combine brown sugar and sifted cocoa. Sprinkle over the top of the pudding. Pour the hot water over the top (I usually add the water gradually as otherwise it often overflows – add a cup at first, and then once it’s been cooking for a while, add the rest). Bake for 180° for approximately 50 minutes. 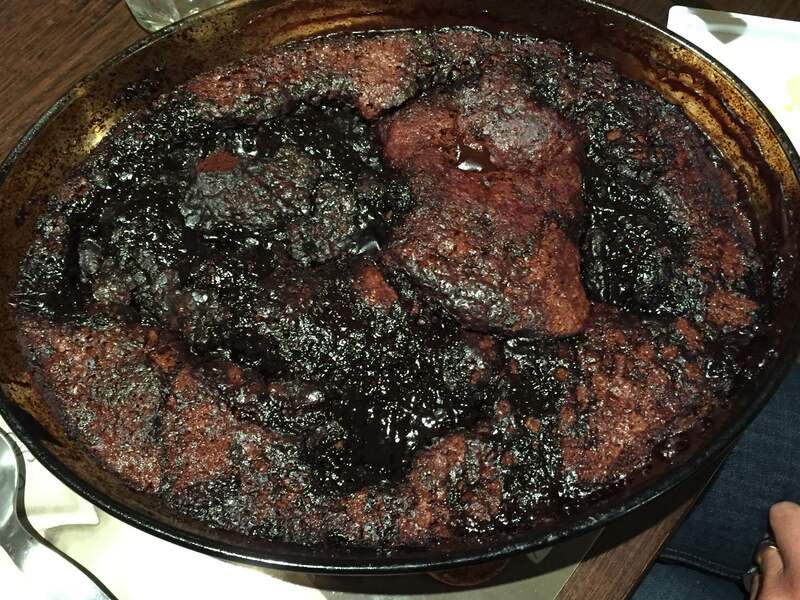 For reference, in the image above, this recipe was doubled and served about 6-8. My travels throughout South East Asia, the US and Europe have definitely shown me one thing… The Melbourne coffee scene is one of a kind. We have the whole thing down pat. Melbournians love their coffee. We also love brunch. And Instagramming photos of food. And we know how to make great coffee (something I definitely can’t say for most of the rest of the world). I am a coffee lover. Before I had ever sipped a coffee, at a young age I had decided I would be a coffee drinker. With a dad passionate about drinking, and making, coffee, I was always so destined. I certainly wouldn’t have made it through 5 and a half years of law school without coffee. We have a great quality coffee machine at home that I have mastered. Tragically, when I developed a lactose intolerance in year 11, it obviously got much more difficult to enjoy coffee when out and about. Until I discovered LF milk makes great coffee, which I could use at home. I couldn’t bear the taste of soy milk, especially not with coffee! It is for this reason that I am ecstatic that in recent times, Melbourne cafes have fine-tuned the coffee scene so that it is better suited to the #foodie trend and fad diets such as GF. For the most part. I do have some pet peeves and concerns I’d like to share! I love this. Many cafes have (somewhat surprisingly) stocked soy milk as an alternative to cow’s milk for years. But only in the past couple of years has the entrance of other milk choices become a thing. Almond milk and (occasionally) hazelnut milk are milk options often offered in cafes. I can’t say that this is an exciting trend for this Allergian, and see point 2 in relation to this. More importantly, I am now starting to see the very-much-welcomed-by-me lactose free (LF) milk served in cafes! This is music to my ears! And my coffee. A Google search of Melbourne cafes serving LF milk failed to find any results so I’ll share with you a few of my fave cafes that serve LF milk. I’d love to hear from readers about your own LF milk spottings throughout Melbourne! Loco in Elsternwick has been serving Zymil (one of the main brands of LF milk in Australia) for a couple of years. One customer used to keep her own bottle of Zymil in the fridge for when she came to have coffee. When other lactard customers saw the Zymil, they naturally excitedly asked for it so Loco began to stock it! What a win! 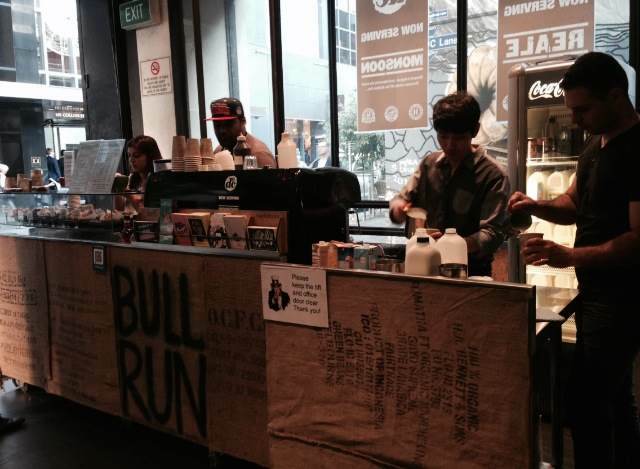 The café that I visit on my way to work in the morning, Bull Run in the CBD, also serves Zymil. This café has a vibrant, charismatic take away coffee stand out the front, which offers a range of milk options, with music pumping in the morning. I have also discovered LF milk at the Attic café in the CBD and Rupert & the Fig in Brighton. Needless to say, as great as this is – there are just not enough!! With soy milk such a staple at cafes, I am really hoping that LF milk raises to this standard. I would expect that there is enough of a demand for it. Zymil and Liddells’ LF milk are available in long-life, and customers would be willing to pay extra or drive further for this option! Cafes are also beginning to offer further milk varieties, such as coconut milk and/or rice milk. Whilst both good options, they are likely to have a bigger impact on the taste of the coffee, which many coffee-lovers would argue is inexcusable! LF milk tastes just like cow’s milk, only it is a bit sweeter. The availability of all these different milk options is both a blessing and a curse for me. It’s great to be able to go to a café and order my weak cappuccino with LF milk. But with this blessing also comes the curse of almond milk (and other nut milks). For those of us with nut allergies, this can be a really big problem. I hadn’t really thought about this until I went to a particular cafe and discovered they served Zymil when I saw it sitting alongside the cow’s milk, the rice milk and the almond milk. As I was standing there watching their incredibly-efficient 3 person coffee-making arrangement that they’ve got going on, I thought about the risk of cross-contamination due to use of almond milk during the busy morning coffee rush. I let them know about my allergy and they ensured me that they would be careful. a) cafes be really careful with the use of almond milk. They should take precautions to ensure that there is no risk of cross-contamination e.g. the consistent use of different milk jugs for different milk varieties, cleaning the frothing stick properly between uses (with a fresh cloth where almond milk has been used), using different spoons to stir the coffee, no milk mix-up etc. This issue really also applies where a cow’s milk Allergian orders soy milk (see my next post on this point). b) It is obvs our responsibility as Allergians to alert a coffee shop to our allergy if there is a form of nut milk on the menu. Coming soon to Allergian Abroad: Coffee-blanca Part 2!